HIGH A smooth, intuitive combo system. LOW A lack of single-player content coupled with an inactive online player base. WTF Whatever happened to those excellent Shining Force strategy games, anyway? Ah, fighting game characters… Can’t leave them alone for ten seconds without them grasping at each other’s throats over the thinnest of storyline provocations. 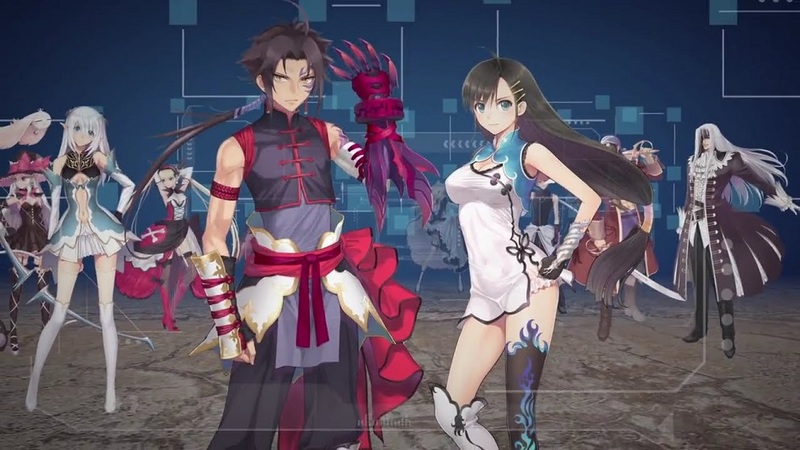 BLADE ARCUS from Shining: Battle Arena is no different, taking a bunch of characters from Sega’s Shining series and having them duke it out in order to get their hands on magical orbs that can grant them whatever prize they wish for. It’s not exactly the freshest script, and the story mode associated with it does little to expand on the motivations of anyone involved. Players simply choose a character, fight a bunch of enemies plucked from the roster, and get the occasional snippet of Visual Novel-style dialogue to move things along in a confusing, unclear manner. Then there’s the usual versus mode, a training mode, an online mode and bang — that’s pretty much everything the game has to offer. It’s plain to see that BLADE ARCUS was designed for Japanese arcades where the player base would theoretically offer new challengers to offset the lack of this basic, bare-bones content. It’s unfortunate that there’s so little to get stuck into because the gameplay isn’t bad at all. Players select a main and a backup character before going into battle, and can call on this partner for support mid-battle, or change to them after each round. It’s a cool idea that adds some variety to matches. The combo system is good too, allowing most attacks to link smoothly into one another. Weak hits can go into mediums, mediums chain into strong attacks, and from there it’s but a short hop-skip-jump to parlay specials into supers. It’s fairly easy to perform cool combos even for novices, and there’s additional nuance in the form of EX attacks and the aforementioned support assists. The selectable roster is pretty decent. As someone who played Shining Force back on the Genesis and laments the lack of any new entries, it was cool to see just how closely Fenrir resembles crazed wolfman Zylo from the original game — retractable claws and all. Tony Taka, character designer and illustrator of many recent Shining games, does excellent work with the cast here. It’s very anime with a slight tilt towards moe, though — there’s a martial artist catgirl and a maid that seems to have fox ears and a tail. Graphically, most of the game is made up of 3D models instead of 2D sprites, and there’s a certain charm to them that reminds me of a smoother, sharper take on Saturn or Dreamcast era games. The animation is slick, the characters look decent in motion, and the backgrounds aren’t badly done. Oh, and the music isn’t bad either. The biggest problem facing BLADE ARCUS from Shining: Battle Arena isn’t its incredibly unwieldy title — it’s the lack of singleplayer content, coupled with an online mode that was dead on arrival. I checked at various times of day when the game released and never once managed to get into a random match. It hasn’t improved since then. It looks like anyone wishing to engage in online brutality will need to set up matches ahead of time through forums or whatever — just diving in and finding someone to trade punches with seems near impossible. Oh, and heads-up — apparently the Steam version removed the console version’s ability to earn points through gameplay to unlock artwork in the Gallery mode, and the Gallery mode itself was also removed just to round things off. Yikes! Disclosures: This game is developed by Studio SaiZenSen and published by Degica. It is currently available on PC, with import versions available on PS3 and PS4. This copy of the game was obtained via publisher and reviewed on the PC. Approximately 6 hours of play were devoted to the single-player mode, and the game was completed with multiple characters. 2 hours of play was spent in multiplayer modes. Parents: According to the ESRB, this game hasn’t been rated yet. There’s little to worry about overall. There’s very little blood (if any), and while there’s occasional flash of a thigh or whatever from the female characters, there’s nothing overly gratuitous. Deaf & Hard of Hearing Gamers: I can’t see there being any issues here. Dialogue is in Japanese, conversations are subtitled and the pre-match poses have quick snippets of dialogue that only Japanese speakers would understand – they’re not translated in-game.